There are some flavors that taste good regardless of their temperature. Caramel is one of those flavors. At room temperature in candy, cold on ice cream or in iced coffee caramel is marvelous. To me though, where caramel really shines is when it’s mixed in into a hot coffee drink. Smooth, slightly dark and rich, caramel serves to bring out subtle notes of the coffee, and when you add a little vanilla and whipped cream, you’re in masterpiece territory. High Class Vape Co has developed an ejuice with just such a combination of tastes. They call it Caramel Frapp. 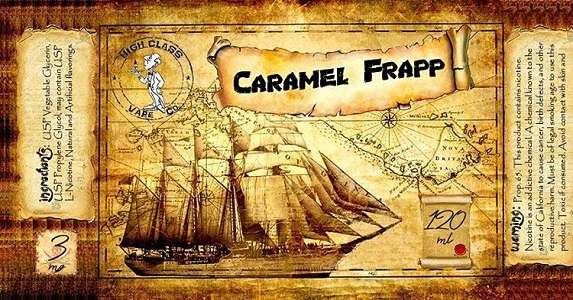 On the inhale there is no mistake that Caramel Frapp is a coffee flavored ejuice. It has a rich, dark brewed coffee note that remains throughout. That is quickly joined by the softly sweet and creamy taste of caramel. On the exhale there’s a hint of vanilla and cream to pull the whole experience together. Caramel Frapp has a smooth vapor with a mild to medium throat hit. The aroma is very much like that of a freshly brewed specialty drink from a high end coffee shop. I’ve been vaping Caramel Frapp from High Class Vape Co for several days and it has been a wonderful experience. It’s a rich, creamy, slightly sweet vape. The caramel and other secondary flavors take what could have been a bitter edge off the dark roast coffee flavor. Caramle Frapp from High Class Vape Co should more than satisfy fans of coffee and caramel flavored ejuices. High Class Vape Co offers Caramel Frapp in 15 ml bottles for $3.50 and 120 ml bottles for $18.00. 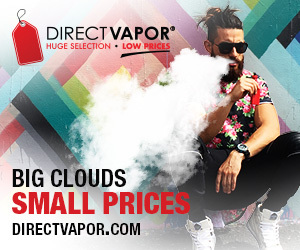 Available nicotine levels are 0 MG, 3 MG, 6 MG and 12 MG. High Class Vape mixes all of its ejuice in a 30/70 PG/VG ratio. I vaped Caramel Frapp in a SMOK TFV4 tank on the VaporFi VEX 150 TC mod and in the Kangertech K-Kiss. High Class Vape Co supplied the bottle of Caramel Frapp I sampled for the purpose of this review. Order Caramel Frapp from High Class Vape Co.